Egyptian security forces foil jihadist attack on security checkpoint in North Sinai's Sheikh Zuweid city. Egyptian security forces on Sunday foiled an attack that was set to target a security checkpoint in North Sinai's Sheikh Zuweid city, the Egyptian military said, according to the Al-Ahram newspaper. In an official statement quoted by the newspaper's English-language website, army spokesman Brigadier General Mohamed Samir said that security forces "were able to thwart the attack after they monitored a gathering of militants near the checkpoint based on intelligence information, killing them through strikes conducted by air forces and field artillery." The statement did not include information about the number of jihadists killed in the preemptive strike. The army spokesman also shared information regarding the army's major hits in the last couple of days, announcing the killing of 14 militants in a shootout during combing and raid operations in the areas of El-Arish, Rafah and Sheikh Zuweid. He added that the killed terrorists possessed three fire machine guns, 234 bullets, two grenades, and wireless devices. Egypt has been fighting an insurgency in the Sinai which began shortly the 2011 ouster of former President Hosni Mubarak and has gotten even worse since the army ousted former Islamist President Mohammed Morsi in 2013. Most of the terrorist attacks in the Sinai have been claimed by the Sinai Province terrorist group, which has pledged allegiance to ISIS. Among the attacks claimed by Sinai Province were the assassination of a top Egyptian police general, who was gunned down as he left his home in a west Cairo neighborhood, and a bus bombing on a tour bus filled with South Korean tourists in the Sinai. 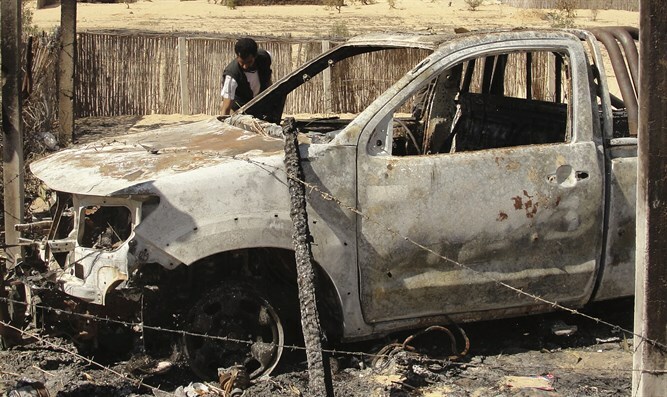 The group has also claimed responsibility for several rocket attacks from the Sinai Peninsula on southern Israel.